Are there certain foods that give you a food grin? Roti canai is one food that makes me happy (if you have never tried it, you must go to Mamak) and this soup is a new addition to the list. It takes a couple of hours to make if you take your time like I did (and a bit of foresight so you remember to soak the beans overnight). The soup is a labour of love… but well worth the love and attention you give it. 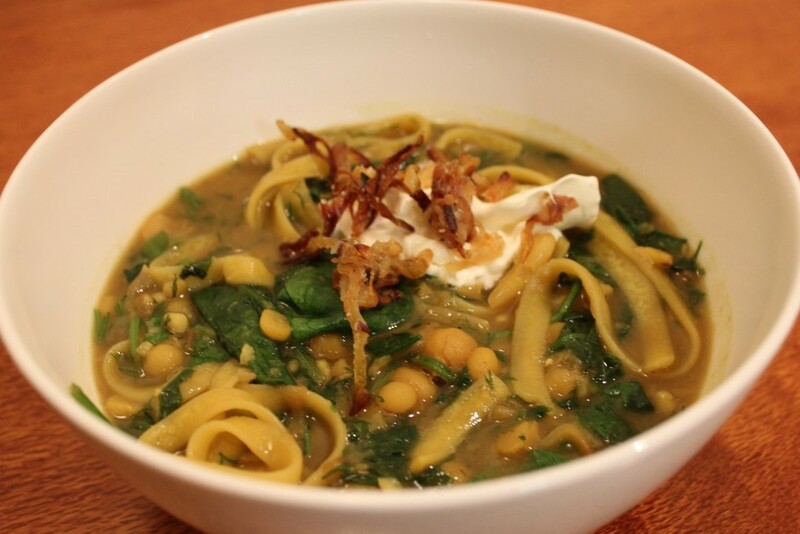 Who knew a “simple” soup of caramelised onion, garlic, turmeric and herbs could be so wonderful? This soup is the Iranian version of minestrone, but I think it is 10 times better. Of course the recipe comes from Plenty More, which I finally succumbed to purchasing a couple of weeks ago. I have modified it slightly because I have no idea how you can caramelise onions in 20 minutes. It took me closer to 45 for them to be the same colour as the picture… but anyway, take your time to make this on a slow afternoon at home and enjoy the grin a bowl of it will give you. Drain and rinse the chickpeas and beans and place in 2 separate saucepans with plenty of water. Simmer over a medium heat for 20 to 40 minutes until just tender. (I used one saucepan and cooked the beans one after the other to save on washing up.) Drain and set aside. Put the butter, onions and garlic over a low heat and cook for about 45 minutes or until soft and golden brown. Stir through the turmeric, 1/2 tsp salt and black pepper. Put 2/3 with the beans and set 1/3 aside for garnish. In a large pan/pot put the chickpeas, lima beans, split peas and stock and simmer for about 35 minutes. Skim the pot as needed and cook until the peas are tender. Add the herbs, green onions and spinach and cook for another 15 minutes. Add more stock or water if it is becoming too thick. Add the noodles (break them up a bit first) and cook for a further 10 minutes or so until the noodles are tender. Stir through the vinegar and check the seasoning. Add more water if the mix is more casserole and less soup. Serves 8 people (apparently) in generous bowls with a squeeze of lime, the extra onions and some sour cream to stir through. The soup freezes well too, bonus!